Pasko is the Filipino term for Christmas. Well, just like last year, I will be celebrating this day away from my family. And here in Japan, its a regular working day which means, I, together with some of my Filipino officemates are obliged to do our jobs. We will be ignoring the glittering lights and illuminations of the city. Never mind the Christmas songs filling the airwaves. Just focus first on our respective responsibilities but after the bell rings, we deserve to have a party. Okay, I admit, I am just assuming that there is a get-together party tonight (come what may after office hours). This reminds me of Simbang Gabi, a tradition I never completed and, I think, I'll never will. Too lazy to wake up I guess. Traditionally, Christmas Day in the Philippines is ushered in by the nine-day dawn masses that start on December 16. Known as the Misa de Gallo (Rooster's Mass) in the traditional Spanish and in Filipino as Simbang Gabi, or "Night Mass", this novena of Masses is the most important Filipino Christmas tradition. These nine dawn Masses are also considered as a Novena by the Catholic and Aglipayan faithfuls. This refers to the Roman Catholic and Aglipayan practice of performing nine days of private or public devotion to obtain special graces. and footsteps of other early risers. and sacred scent of sampaguitas. But anyway, a day after Christmas, I will be going home to the Philippines to welcome the coming year with my family of course. 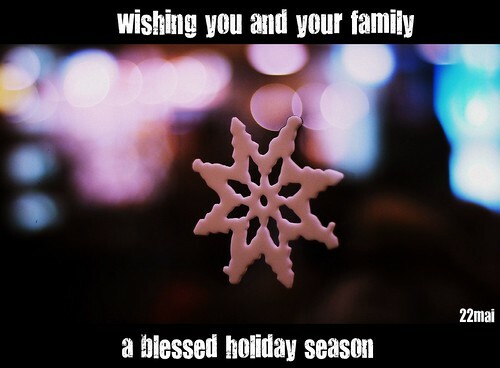 To all my friends, and to everyone who reads this, I am wishing you and your family a very blessed holiday season. By the way, I haven't done yet the tag. Because the more I think how weird I am, I can't write about it anymore. Just imagine that it's part of me already, each day I wake up with the same horrid face, it becomes normal to me. How weird I am bah? I dress crossly is one of the strange things I do every morning I guess. naku crying mode ka pala sa tokyo hehe. Last year sa Japan din ako nagcelebrate, walang kwenta hahaha. Lalo na yung new year, bagong bili pa ng dslr ko, akala ko makakafireworks shots ako. Wala pala. @Winnie, salamat at merry christmas din sa yo. maayong pasko ? i don't think i've spent christmas in the philippines, not that i can remember. it sounds like a lot of fun. yes it is. by the way, are you a filipino?